The Great American Eclipse has swept the nation, and the photos are breathtaking! Totality, taken at the Johnson farm in Lexington, MO, on Aug 21, 2017. WHOA! You can clearly see the wispy features of the corona in this photo. What follows is a whole lot of eclipse images, phone pics, professional photographs, videos, partial eclipse photos, photos of totality, the diamond ring, Baily’s beads, you name it! So buckle up, this is one heck of a Great American Eclipse ride! Partial Solar Eclipse as seen in Los Angeles, CA, on Aug 21, 2017. Time Lapse of Partial Solar Eclipse as seen in Los Angeles, CA, on Aug 21, 2017. Partial Eclipse as seen from New Jersey on Aug 21, 2017. Partial eclipse as seen in El Paso, Texas on Aug 21, 2017. Partial Eclipse in Rochester, NY, on Aug 21, 2017. Photos of the event taken by @UCIPhysAstro. What great work by Katy and Arianna, the event drew in over 1000 people to watch the eclipse!! Solar Eclipse projected through leaves in Carbondale, IL on Aug 21, 2017. Solar eclipse projected through leaves on Aug 21, 2017. The leaves of a tree act as pinhole projectors, and because there are so many leaves, you have solar eclipse projector-ville at your feet! Really neat. 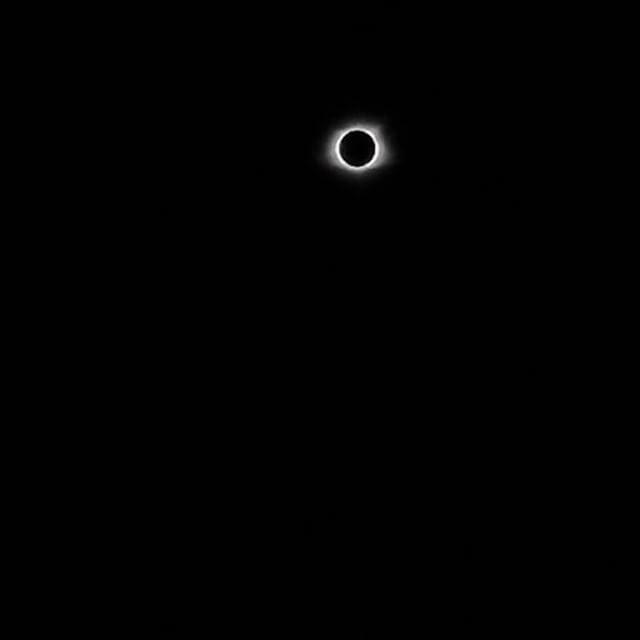 Totality in Madisonville, KY, on Aug 21, 2017. The beauty of videos is that you get to hear the crowd’s excitement! Nothing better than hearing people being thrilled about astronomy. Totality during the Great American Eclipse, Aug 21, 2017. Totality as seen from Gallatin, TN on Aug 21, 2017. Totality, in Carbondale, IL, on Aug 21, 2017. Diamond Ring during totality, in Carbondale, IL, on Aug 21, 2017. Diamond ring as seen during totality in Glendo, WY. Diamond Ring during totality in Sylva, NC, on Aug 21, 2017. Baily’s Beads approaching a Diamond Ring, as seen in Weiser, ID, on Aug 21, 2017. Baily’s beads moving into the diamond ring in Charleston, SC, on Aug 21, 2017. Baily’s Beads with solar prominences as seen in Charleston, SC, on Aug 21, 2017. Solar corona visible during totality in Fort Fetterman Historic Site, WY, on Aug 21, 2017. Bear in mind: solar prominences can get really high—several Earth diameters above the Sun’s surface! The in the above photo at 3 o’clock looks like the same one in Jason’s at 4 o’clock; performing a crude measurement, and using the fact that the Sun has a diameter of 1.39 million km, or about 865,000 miles, I estimate that prominence to be about 54,500 km, or 33,900 miles, high—that’s over four Earth diameters! Isn’t our solar system’s star wonderful? Totality through clouds on Aug 21, 2017. Time lapse of totality as seen in Casper, WY on Aug 21, 2017. And, saving the best for last: my friend and planetary scientist Tanya Harrison got to experience the moment from Alaska Airlines! Totality from 38,000 feet above, and 800 miles off the coast of Oregon, on Aug 21, 2017. No matter where you were, if you saw this eclipse, you experienced a moment that you shared with millions of people, a moment in which nothing mattered, nothing but basking in the glory of science, and chance, making it possible for us to be able to view something so spectacular from our planet. Cherish that moment—it was beautiful. NextThe Milky Way IS Teeming with Black Holes, but there’s MORE! Donations aren’t mandatory, but if you’d like to support me, you can!